If you’re at all familiar with my designs you’ll know that my main focus is on children. I’ve been sewing clothing and children’s items a lot longer than I’ve been knitting and I think its safe to say that my knit designs often reflect the same sort of styles I like to sew. I love classic and heirloom style clothing for kids and all the little details that go along with that specific style. I’m always drawn to A-line silhouettes, pretty collars and necklines, and dainty embroidery. Creating things that are functional is important to me and a new design often starts out as a piece I’d like to knit for one of my own kids. Trying to find that balance between classic, fun, and functional is what its about when you design kid’s stuff. I honestly don’t have a favorite. 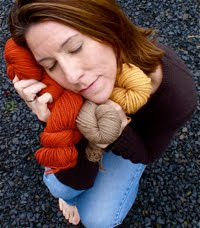 I love everything to do with knitting. As much as I enjoy working in the round I’ll just as easily decide on a design with seams. I love texture and cables but am also enamored with simple shapes and stockinette. I’ll knit back and forth and I’ll cut a steek. I think the whole reason I made the transition from knitter to knit-designer is my drive to try everything. When I first started buying knitting patterns because I wanted to knit things for my own kids I figured out pretty quickly that there are precious few patterns sized for older kids so its always been important to me that my designs are available in a wide range of sizes. Most of my patterns are sized from a toddler size 2 up to a youth size 12. Though I just don’t feel every design is appropriate for older kids most are and its not much more work to offer a wider size range. I do look at other designers’ work simply because I’m a knitter. I have subscriptions to magazines and I visit knitting sites and blogs just as much as anybody other knitter. I don’t worry about being influenced by other designers because I feel that I have my own style and aesthetic that I work within. I’m not really sure how to answer that. Patterns should always be clear and understandable no matter what experience level they cater to. At the same time there’s so much information out there in the form of online tutorials, books, and classes that anybody can find an answer to almost any question or instructions for a technique. I think its up to knitters to investigate new things and to be motivated enough to get their questions answered by doing a little research. I’ve made it a point to list “Skills Needed” on all my patterns so knitters will always know what to expect before they purchase the pattern which I think is helpful. I’ve always done all my own knitting. I did try to use a sample knitter once and though she did a great job I found that I felt really distant from my own design. I often make changes to ideas as I go and that’s something that’s harder to do once you’ve handed it off to another knitter. I may consider a sample knitter again in the future but only for completed designs that I’ve already knit myself and need extra samples of for trade shows or something like that. No, but there are many designers I admire and learn from just by paying attention to discussions and reading interviews and articles. Not really. I’ve just sort of gone where it takes me. I’ve been content to primarily self publish. I’m considering some bigger projects in the near future but really I’m just doing what works for me as I go. I doubt I’d be doing this at all if it weren’t for the Internet. I “accidentally” started designing right when knitting blogs and down loadable patterns started really taking off. I honestly believe I was just at the right place at the right time. Though things have grown and my patterns are available in printed form through Deep South Fibers I continue to use the Internet to offer pattern downloads plus all the fun stuff like blogging and writing the occasional tutorial as well as interacting socially with other knitters and crafters. The internet also makes it easier for somebody like me who has very little business experience to be able to learn about things like advertising and allows for opportunities I otherwise wouldn’t have or couldn’t afford to take part in. Absolutely! I’ve been working with Joan Beebe exclusively for a while now and could never thank her enough for catching all my weird math and backward thinking. I’m an extremely visual knitter/designer so there’s often a really important chunk lost between what I mean and what I write down. Joan’s never ending patience is invaluable. I wouldn’t consider publishing anything without working with a dependable tech editor. Balance is one of those things that always seems to be just out of reach. If I’m working I want to be outside hiking or playing with the kids. If I’m playing I feel like I should be working. Really I just try to feel like I’ve made some progress every day whether its writing up a pattern, finishing a project around the house, or weeding the garden. If all I manage to do with my day is hang out with the family and end the day feeling good, that’s good enough. Not very well. One nasty email is often enough to wreck my whole day and I have a hard time shaking it off. I think that sometimes people don’t realize that most designers go out of their way to make sure patterns are correct and a project will turn out the way it should but we aren’t magical. We can’t make every design fit every body perfectly and we aren’t responsible for another knitters yarn substitution decisions. Most of us work to the standards set down for us and do our very best to write clean, clear instructions. Really, I’m just a mom sitting here in my kitchen trying to figure out what to make for dinner and wondering if I have time to throw in one more load of laundry. I think sometime customers forget there’s a real person on the other side of the pattern. If that ever happens I’ll let ya know. I’m very lucky to have a supportive partner both financially and emotionally. Its important to both of us that I be home with the kids so the fact that I’ve found a way to make a little money to contribute to the household and do something fulfilling just for me is a total bonus. What advice would you give someone who wants to pursue a career in knitting?Use a tech editor. Listen carefully when other designers talk business. Be as helpful as you can but don’t allow yourself to be walked on.